In mid-April 2009 my wife and I and our numerous dogs piled into our small RV and headed out for a long road trip to the deserts of southern California and southern Arizona. We both have jobs that mostly entail sitting at computers, and it turns out that in this modern world of widespread wi-fi you can sit at a computer just as well at many campgrounds as you can at home. And then you can take weekends and nights and occasional days off to seek out the local fauna. We were trying to time our trip such that the spring herps would be out in number, but it would not yet be insanely hot. 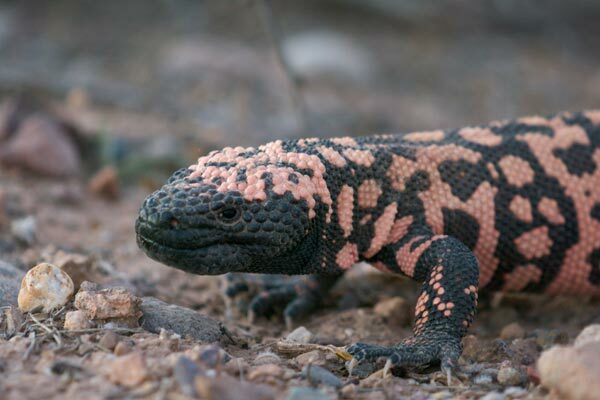 In particular we wanted to be in Gila monster country in early May, when statistics show that Gila monsters are most likely to be seen, for the Gila monster was the U.S. herp I most wanted to add to my life list. Our first real destination was Borrego Springs, where we would spend a week and a half. On the way down we spent a night at Red Rock Canyon (the California one). 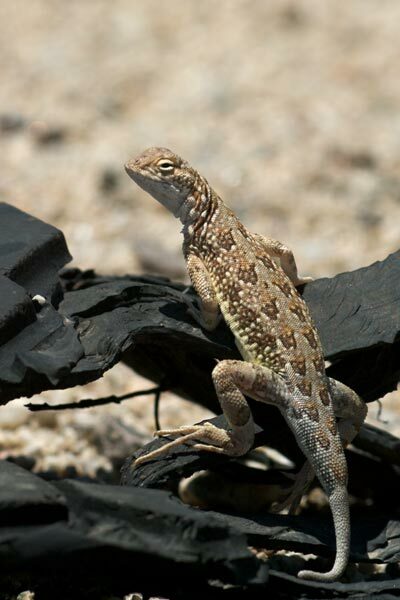 Desert night lizards (Xantusia vigilis) were plentiful in their usual hiding places beneath fallen Joshua Trees. We then spent a night in the San Bernardino mountains, near Big Bear Lake. 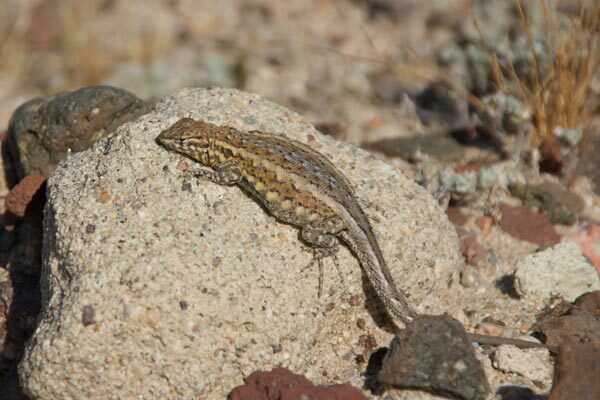 I didn't really have any significant herping opportunities there, but I did manage to find my first Southern sagebrush lizards (Sceloporus graciosus vandenburgianus, or just Sceloporus vandenburgianus for the splitters among you). They were abundant around the campground. We arrived at our campground in Borrego Springs in the early evening. 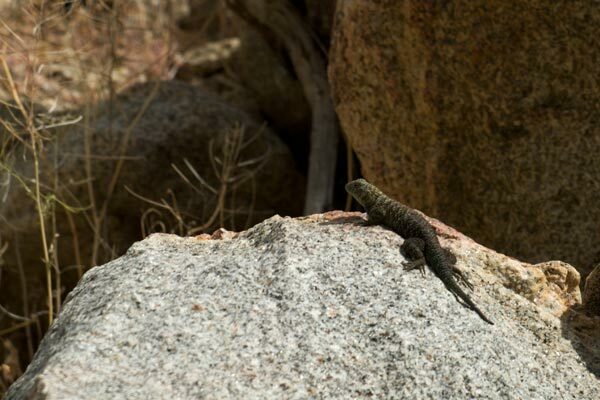 Just twenty yards or so from our parked RV I spotted a lizard taking in the last rays of the sun on a large granite boulder, and from a distance it didn't quite look like one of the omnipresent side-blotched lizards. Closer examination revealed a particularly camera-friendly western long-tailed brush lizard (Urosaurus graciosus graciosus). I only ended up seeing one other of these while in Borrego Springs (and the other one was indeed perched in some brush, as it should be). Several evenings I took a rental car out for some road cruising. A heat wave hit while we were visiting, with daytime temps climbing past the 100 degree mark. But it cooled off pretty quickly at night, with temperatures dipping to around 60 degrees in two or three hours once the sun set. So there weren't enough suitable hours to rack up huge nocturnal herp numbers, but there was still quite a bit of variety. 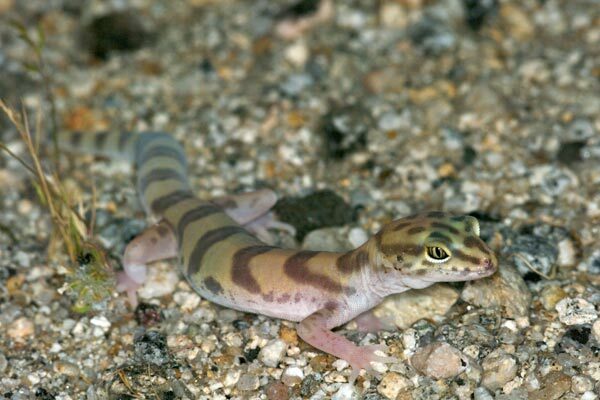 This individual was so nearly perfectly banded that I would suspect it of being a San Diego banded gecko but for its location along S2 in Anza-Borrego Desert State Park. 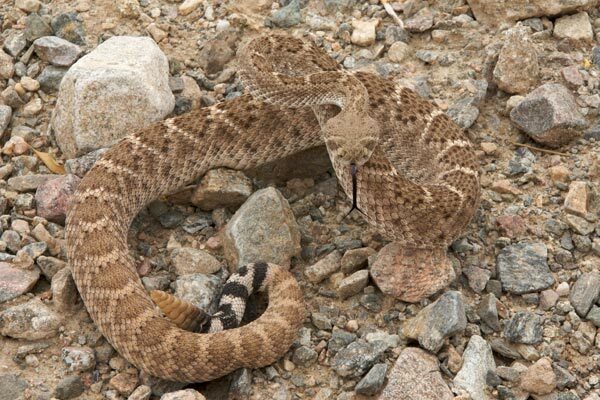 This was the biggest and most flattened sidewinder I came across. 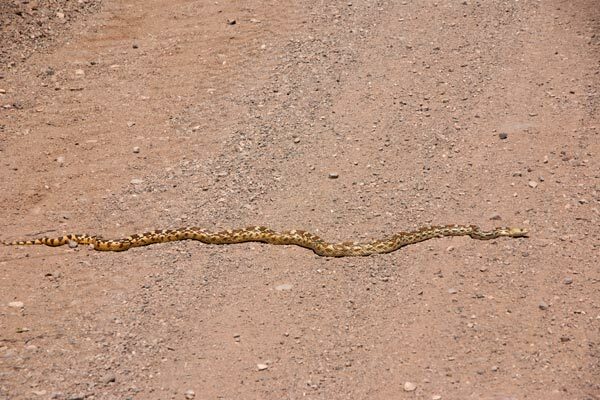 I encouraged it off the road to prevent it from becoming even more flattened from the passing traffic, an action of which the snake did not approve. I also came across one adult spotted leaf-nosed snake (Phyllorhynchus decurtatus), a species I had only seen once before, in Arizona. While I was pulled over trying to get this squirmy little snake to sit still for a photo, another driver pulled over and said "what have you got there?". 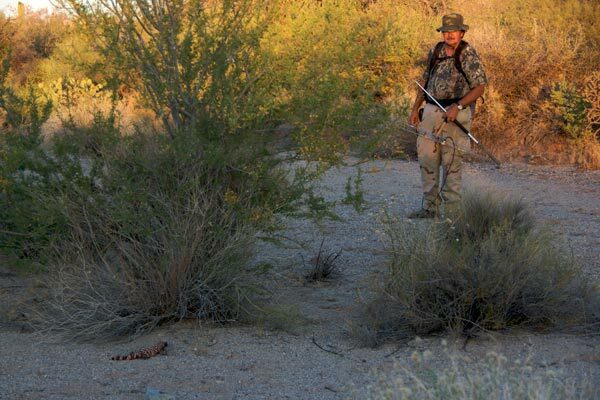 I assumed it was border patrol, like the guy who pulled over while I was admiring the last shovel-nosed snake I had seen. Instead it turned out to be a couple of fellow herpers. They joined me in trying to get a decent photo of the uncooperative snake, but gave up after a few minutes. I kept with it for perhaps five minutes more, and the snake finally stopped wriggling for a short while. 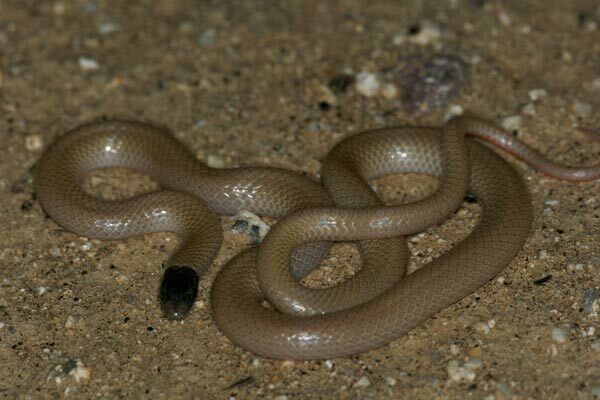 The last of the -nosed snakes that I came across was also the snake I most often saw dead on the road -- the long-nosed snake (Rhinocheilus lecontei). 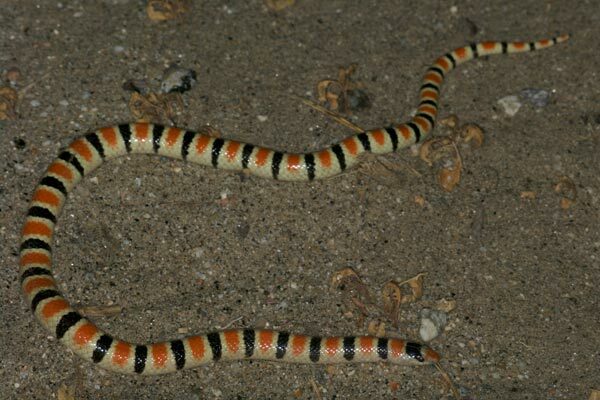 My theory (which I made up on the spot and have not attempted to corroborate with actual evidence) was that these snakes become active earlier in the evening than the other larger snakes, and are thus more likely to be on the road at the same time as cars. 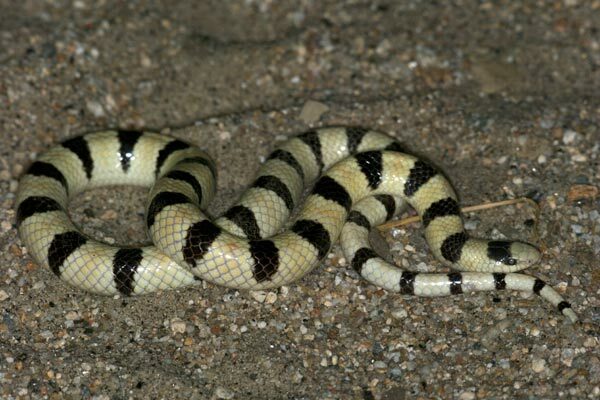 However, on my last night of road cruising, I finally found a live one, and it was at about 10:30 P.M. when the temperature had dropped below 60 degrees and all the other snakes had gone back to bed. 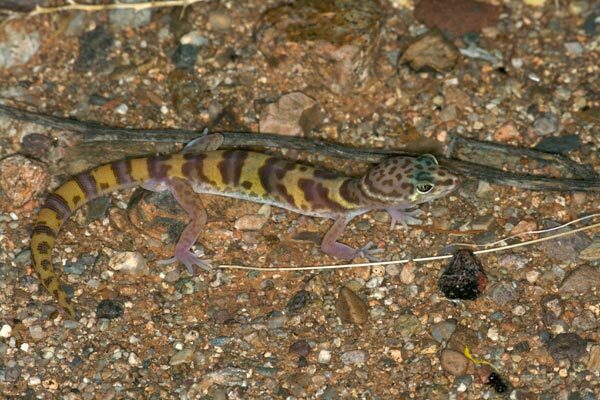 On most nights I would make at least one pass through the higher-elevation areas when the temperature was in the mid-60's with the faint hope of encountering Coleonyx switaki. 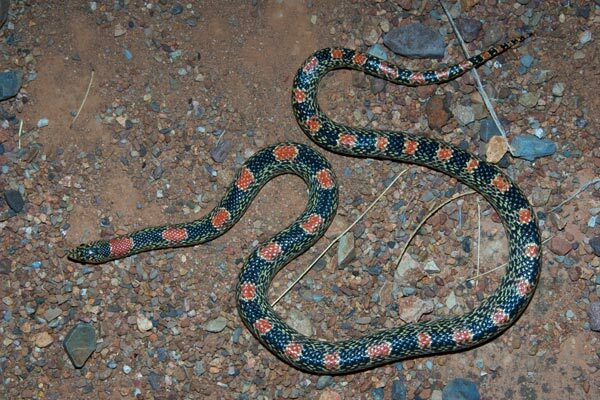 Alas, it was not to be this time, but on one of these attempts I did find another lifer snake -- the Western black-headed snake (Tantilla planiceps). 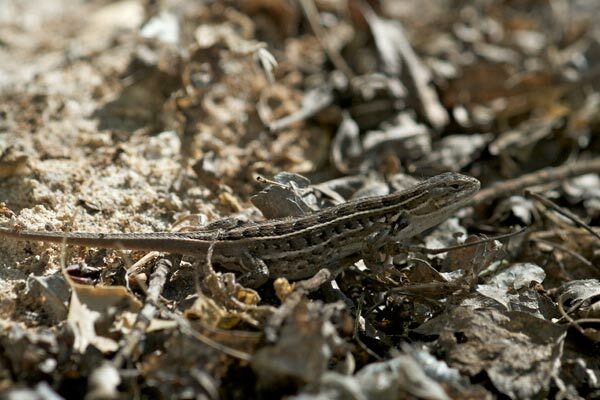 The unusually non-cameraphobic whiptail in the next photo was about to endure the scare of its life. Shortly after the full-body basking shown here, it jittered its way into a leafy bush about six feet ahead of us on the trail and momentarily disappeared. A fraction of a second later it was back in the middle of the trail, and so was the huge coachwhip that had essentially flown out of said bush in hot pursuit. I've never seen two herps move that fast -- one instant, empty trail; the next instant, whiptail and large hungry snake hit the trail simultaneously. The whiptail zipped past us down the hill. 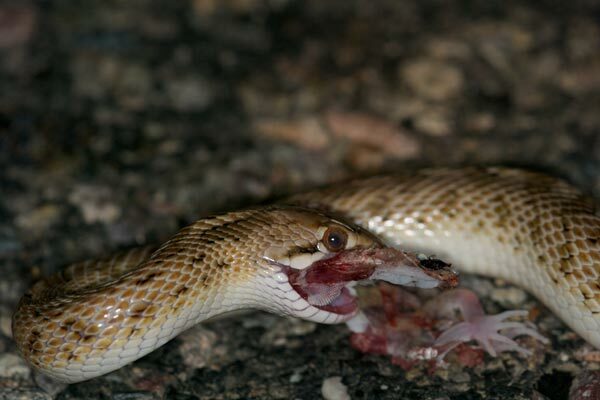 The coachwhip saw us and decided that we looked more frightening than the whiptail looked tasty, so quickly fled into the nearest cover. I didn't have nearly enough time to take a photo, but the image of that surprised whiptail and lightning-fast predator will be burned into my brain for some time to come. 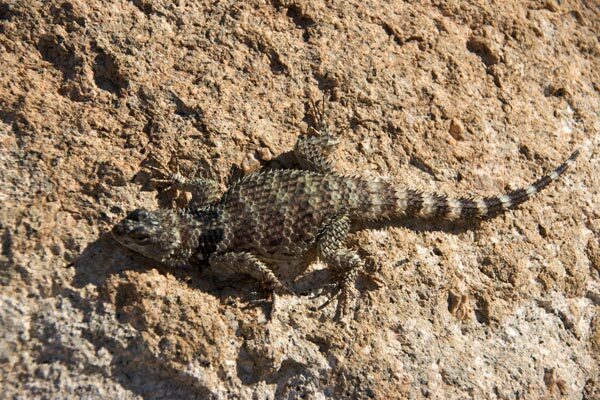 I saw a few granite spiny lizards (Sceloporus orcutti), but they were all particularly wary, so I only got photos from a distance. Fortunately the much more interesting banded rock lizards (Petrosaurus mearnsi), while no more common, were less wary. 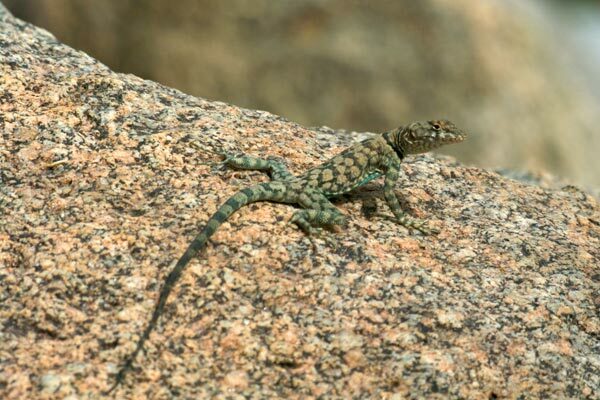 Unlike the granite spinies, which would typically dive for the nearest crevice when disturbed, the banded rock lizards tended to scurry a short distance and then hold a pose. Where I see banded rock lizards, I also usually find a few Baja California brush lizards (Urosaurus nigricaudus) and this trip was no exception. 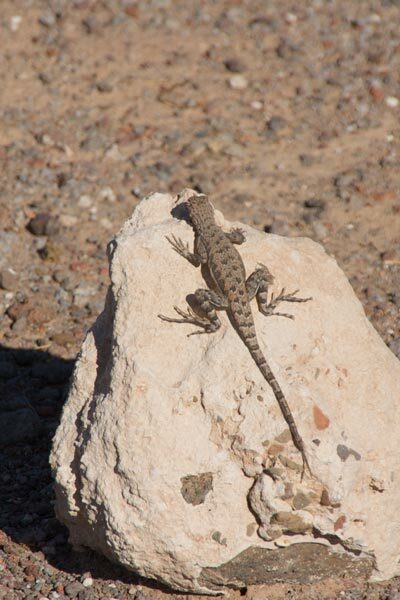 We also saw a few of everyone's favorite large rock-dwelling herbivorous desert lizards, one of which was kind enough to stay in plain sight for awhile. 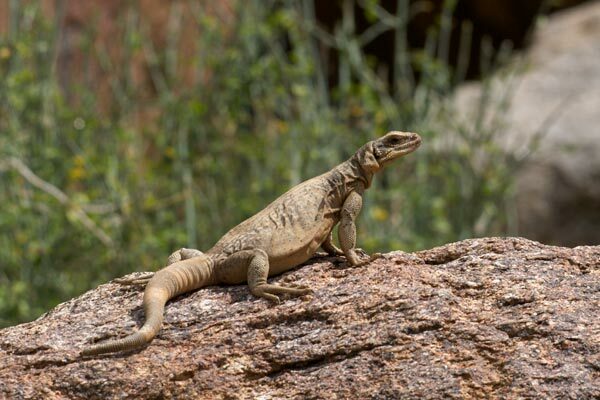 I am of course referring to the common chuckwalla (Sauromalus ater). 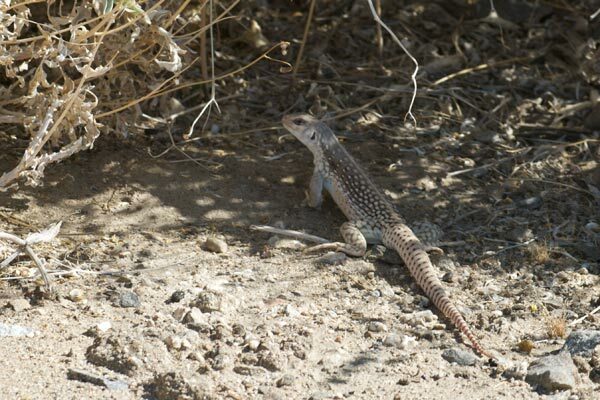 Those were all the different types of lizards I photographed at Borrego Palm Canyon that day. 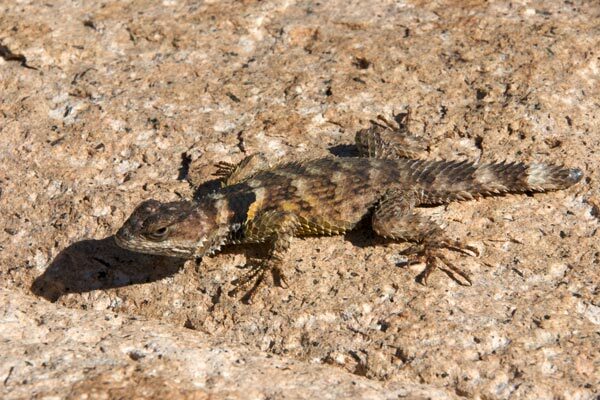 I had really wanted to see a Baja California collared lizard, which would have been a lifer for me, but was once again thwarted. 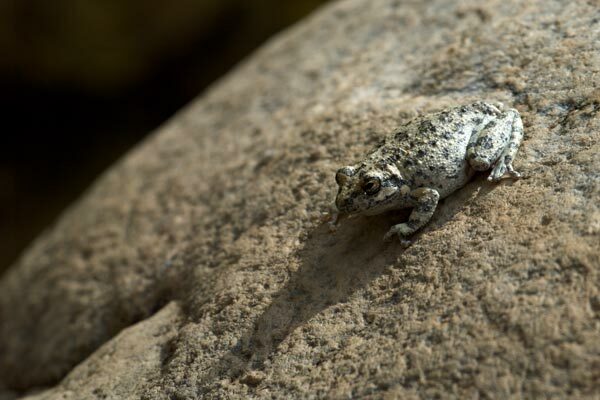 Along with all these lizards and the one coachwhip, we found a number of adult California treefrogs (Pseudacris cadaverina), most of which were huddled together on the shady side of one large granite boulder along a stream. 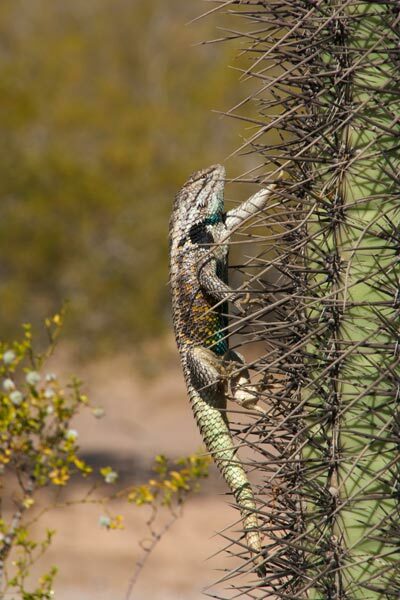 With only a few days left in the area before we were due to head east towards Tucson, I decided to take a long lunchbreak on the hottest day left at the hottest time of day to make one more attempt to find a Baja California collared lizard (Crotaphytus vestigium). Back to Borrego Palm Canyon I went in the early afternoon on a 95-plus-degree day. 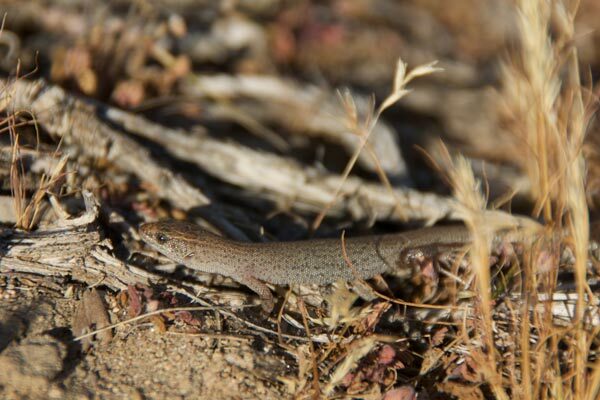 There were few signs of life at that hour; even the normally ubiquitous side-blotched lizards were laying low. 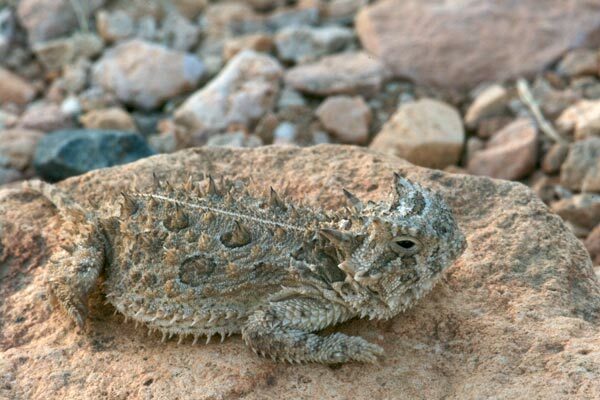 I hiked the most boulder-strewn portion of the canyon with my eyes looking for lizard shapes on the largest distant boulders, and it paid off with this attractive lifer. 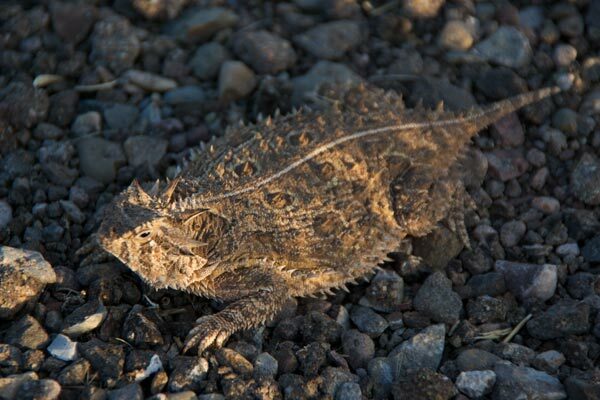 It wasn't in a modeling mood, so I didn't end up with any close-ups, but I followed it around at a distance for ten or fifteen minutes and admired its striking pattern and big fat side-blotched-lizard-devouring head. Woo-hoo! I saw one more individual run off when I hiked back to the car, but that one was even less cooperative. On our way east towards Arizona, we saw many more desert iguanas, including this one that had apparently just emerged from a burrow and wasn't in the mood to rush off just yet. 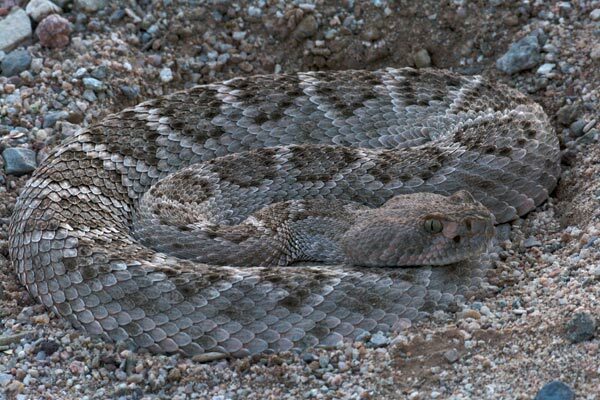 The final interesting California herp of this trip was this Western Diamond-backed Rattlesnake (Crotalus atrox), resting in a wash near our campground close to the Colorado river. We were out for a morning walk with our dogs when I spotted this snake, after my wife and a couple of dogs had not noticed it as they passed by. 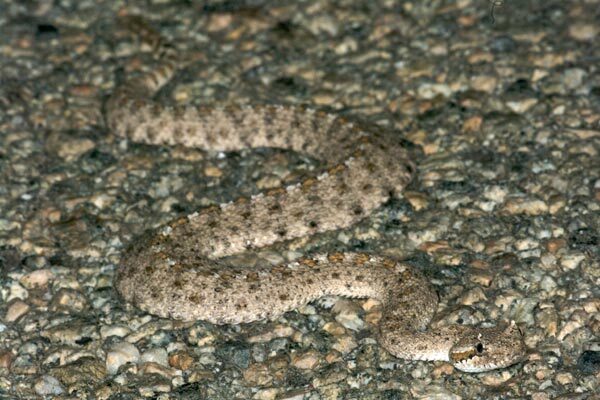 After crossing from the California side to the Arizona side of the Colorado river, the first interesting herp was the same as the last one we saw in California -- a Western Diamond-backed Rattlesnake (Crotalus atrox). I spotted this one hanging out in a dirt parking lot at Mittry Lake Wildlife Area as we drove past. When I came back to take some pictures, it first tried to backslide its way to freedom. 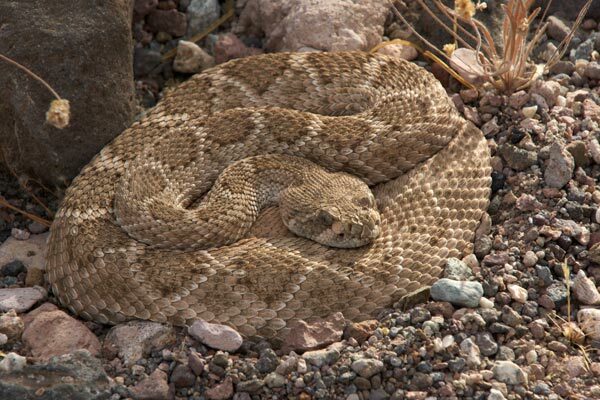 When it slid back into the base of a small hill it switched tactics and went for the traditional I'm-a-scary-rattlesnake posture instead. One of our innumerable (well, OK, 5) dogs is a 16+ year old completely blind chihuahua mix. Halfway between Why and Tucson she started getting restless. Sometimes that means she's thirsty, so I tried pouring some water for her -- not interested. Therefore it was time to pull over and let her commune with nature before she decided to commune with the inside of our RV instead. So we stopped in the first large-enough dirt pullout along the road and I hopped out and found a thorn-free area in which to let her attend to her business. While I was waiting, I noticed a lizardy shape perched on a hunk of car tire nearby. 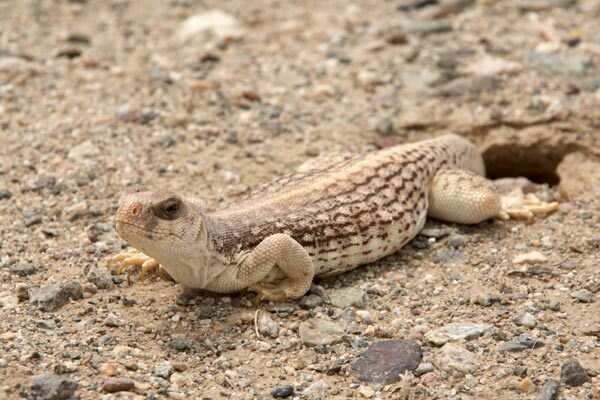 This shape turned out to be an Elegant Earless Lizard (Holbrookia elegans), a lifer for me. So it turns out that even old blind dogs are helpful when herping. 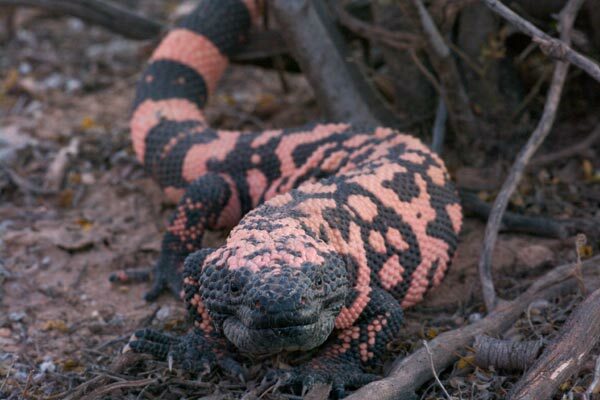 As I mentioned in part 1, my top goal for this trip was to find a wild Gila monster. 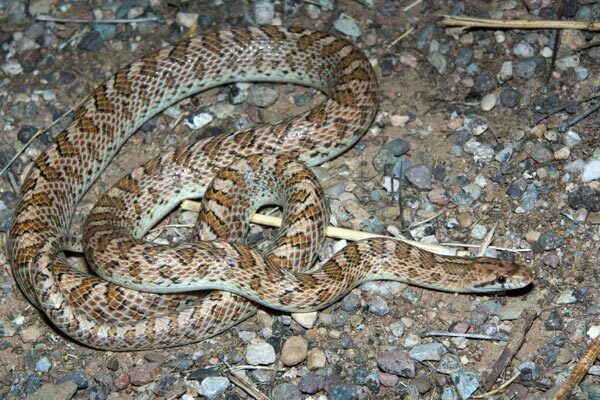 Since this is not something best left to pure chance, I stacked the deck as far as possible in my favor by hooking up with my buddy Roger Repp of the Tucson Herpetological Society (a most excellent organization). We planned to go out herping the weekend after I arrived in town. Before that, he gave me some advice on where to try road cruising not too far from where we were camping. 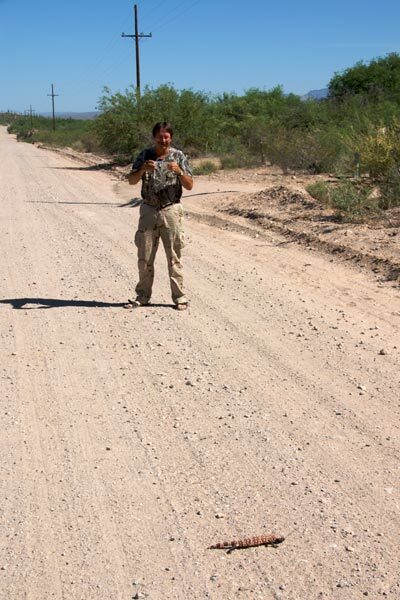 In addition to about a hundred and fifty border patrol vehicles, I did end up seeing a few nice snakes. 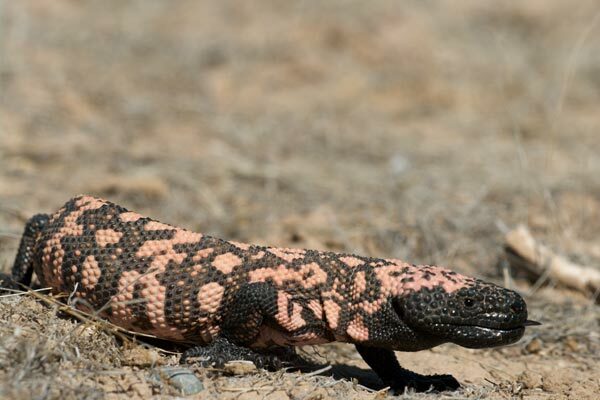 On Saturday Roger picked me up early in the morning to give us time to drive out to the spot he deemed most likely to produce a Gila monster for us, based on his success rate on earlier visits. 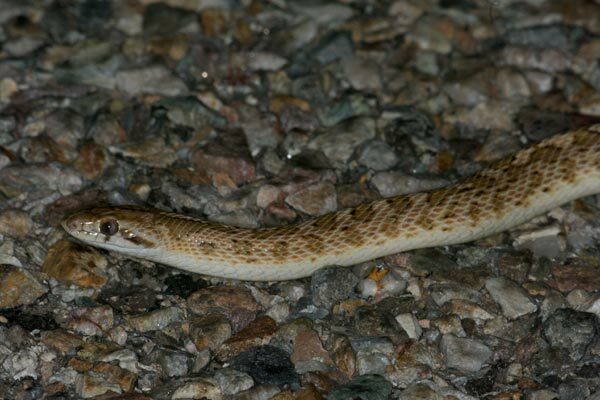 Discounting the occasional whiptail zipping by, the first sign of reptilian activity was a western patch-nosed snake (Salvadora hexalepis) stretched out in the road. 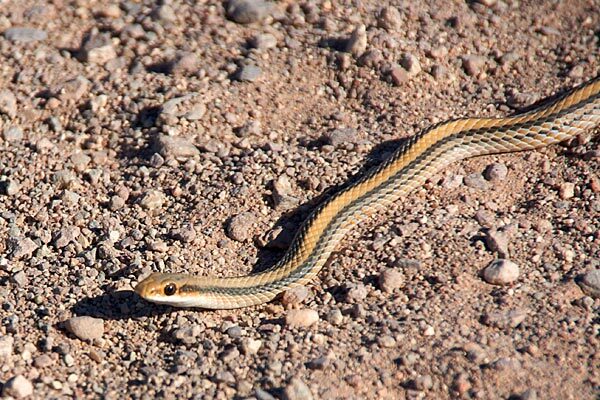 Though it was early and not yet too hot out, the snake was warm enough to allow only this one quick photo before speeding off into the desert. Roger had estimated that our window of monster possibility was from about 8 AM to about 10 AM. We reached the far end of our planned route at about 9:30 having seen only the patch-nosed snake, and I was just a little worried that the conditions were not appropriately herp-friendly for some unknowable and probably whimsical reasons. But Roger was still brimming with confidence, at least externally. "We'll just have to find 'em on the way back!," he assured me. About ten minutes after turning around Roger let out the kind of ear-splitting shout I had been hoping for. "OH YEAH, BABY! WHAT'S THAT THERE?! HUH?!? DID I NOT PROMISE YOU A MONSTER?!?" And sure enough, there it was, lumbering across the gravel road, my first wild Heloderma suspectum. After we had found the Gila monster, all the pressure was off. It didn't matter if we saw another herp all day as far as I was concerned; everything else was just icing on the cake. But we did see more fine herps as well. 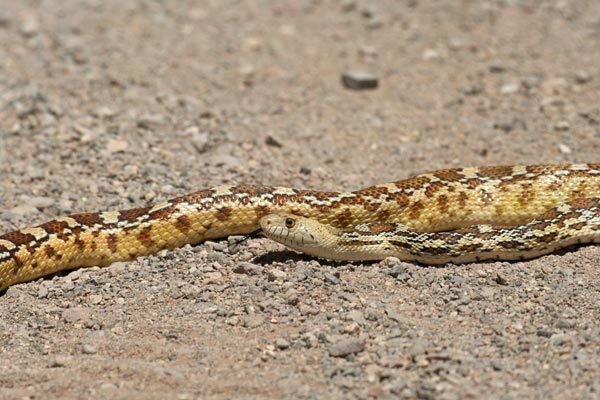 Next on the list was a bright shiny large adult Sonoran gophersnake stretched out across the road. A short while later we saw a large dark snake quickly crossing the road. Our first thought was that it was a coachwhip, but it seemed too stocky for that. Roger, who was driving on the snake side of the road, recognized it first -- "King! Don't let it get away!" 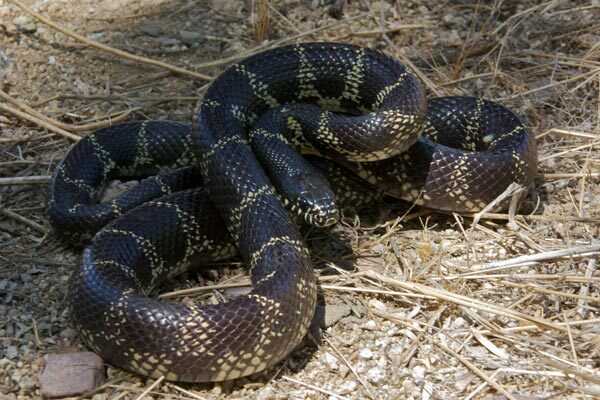 I jumped out and detained the snake, which expressed both its displeasure and its cloaca in my direction. 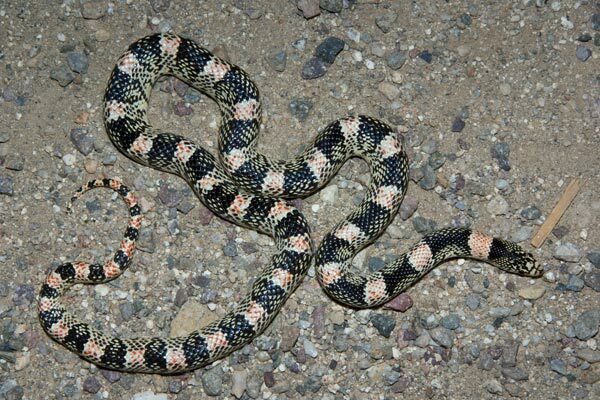 We both were excited by the find -- I was excited because this was my first desert kingsnake (Lampropeltis getula splendida), and Roger was excited because he rarely sees kingsnakes in this corner of Arizona. 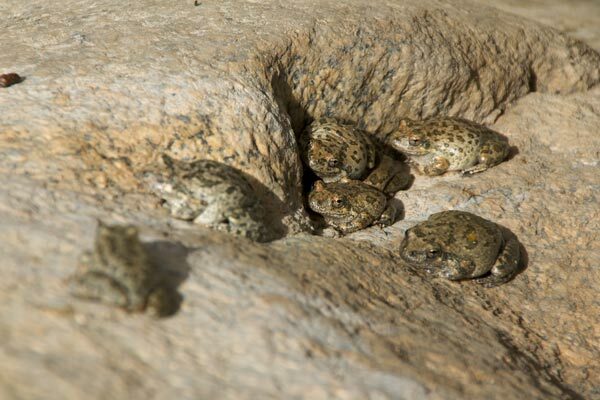 In the heat of the day we moved to a higher elevation where we looked for Chiricahua leopard frogs at a spot where Roger had seen them before. We did indeed see them again, perhaps as many as twenty or so, but I only saw them as they leapt into a stream, and I came away without any photos. This might seem a little sad, but all I was thinking was "frogs, schmogs -- I saw a Gila monster!". 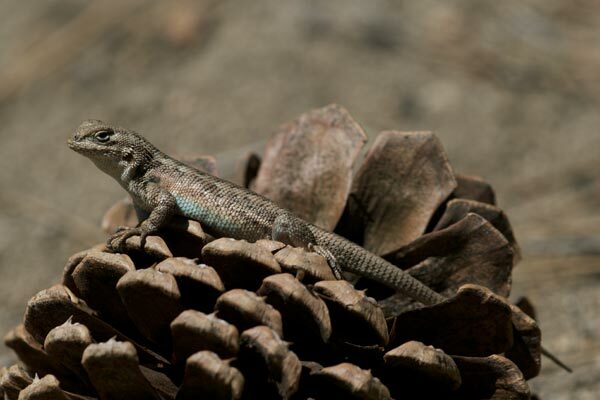 On the way up to the leopard frog spot, I got a few photos of another small earless lizard. 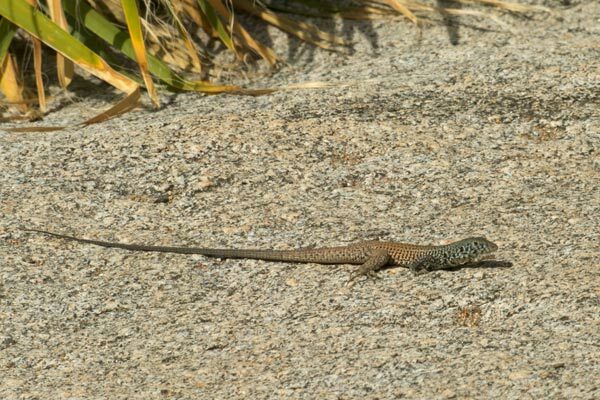 I'm not sure whether this is another elegant earless lizard (Holbrookia elegans) or a common earless lizard (Holbrookia maculata); the two species are extremely similar in appearance and their ranges overlap in this area. (Not everyone even agrees that they are distinct species.) Please let me know if you see any smoking guns in this photo. 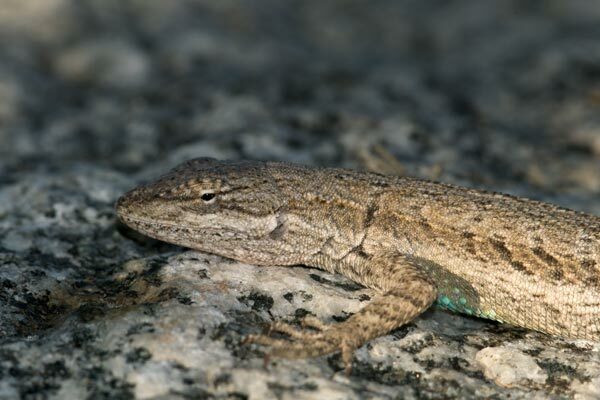 At one point while driving around in the morning I mentioned to Roger that I had always wanted to see bunchgrass lizards (Sceloporus slevini). 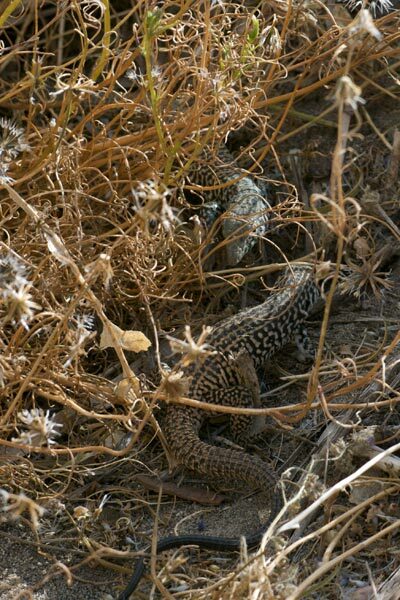 In the Stebbins field guide that was the herp bible of my youth, the bunchgrass lizards were pictured right next to the western fence lizards, which were (and are) the common lizards where I grew up. 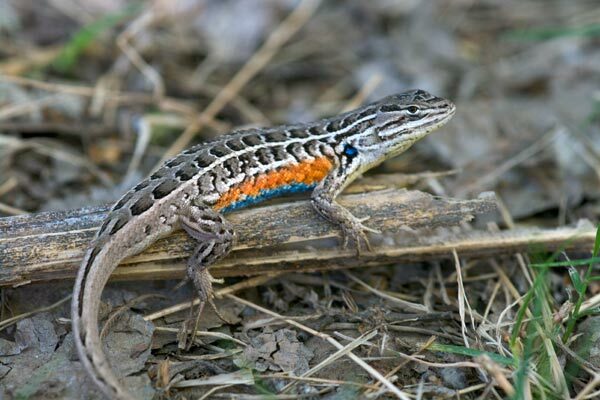 I always thought of the bunchgrass lizards as being the beautiful and exotic third cousins (perhaps once or twice removed) of my familiar fence lizards. 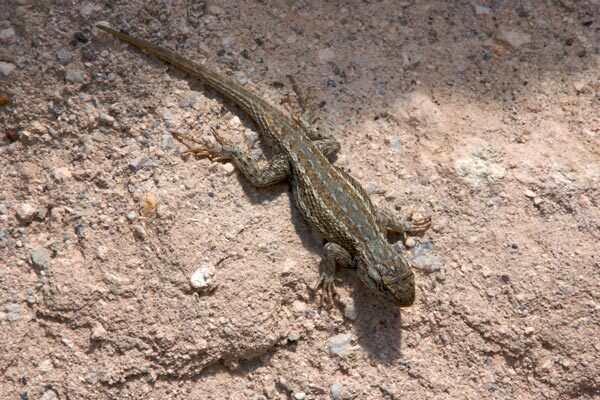 But since the habitat of bunchgrass lizards is very different than the habitat of Gila monsters, and at my insistence we had orchestrated our day to maximize the chance of seeing Gila monsters, I didn't give the bunchgrass lizards another thought. 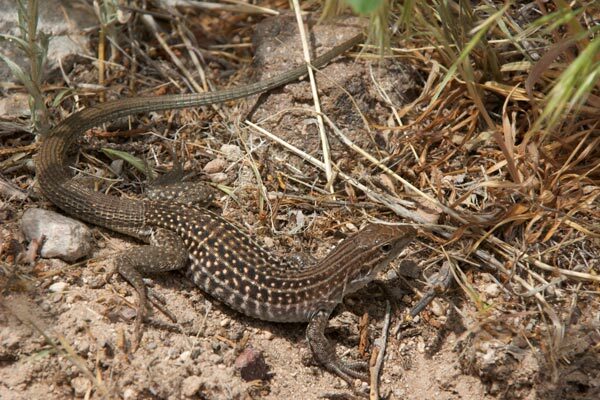 That afternoon, while we were nearing the Chiricahua leopard frog spot, I saw a small lizard dash by in the long grass. 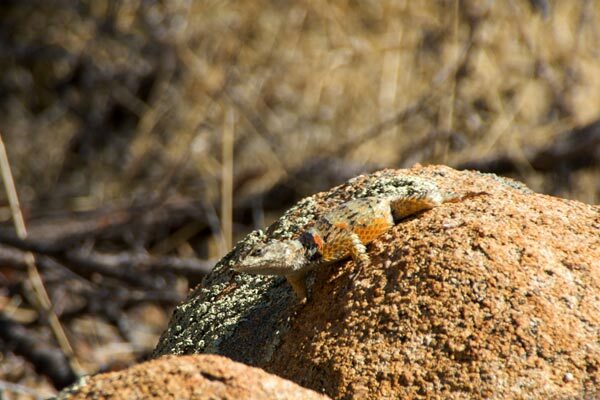 It looked too big to be a side-blotched lizard and too colorful to be any of the other small phrynosomatids. I said "hey, I think that's a bunchgrass lizard!". And so it was. The first one managed to elude my camera (and hand), but I had better luck a little later on, getting photos of first a colorful male and then a not-quite-as-colorful female. 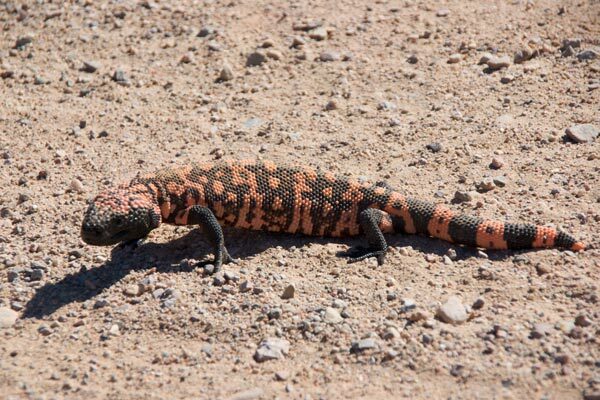 As the afternoon grew late we headed back down to the same area where we had seen the Gila monster in the morning to see what we could find at the end of the day. It didn't take us long to find a second Heloderma suspectum, larger than the one we had seen in the morning. It was a veritable monster-fest! 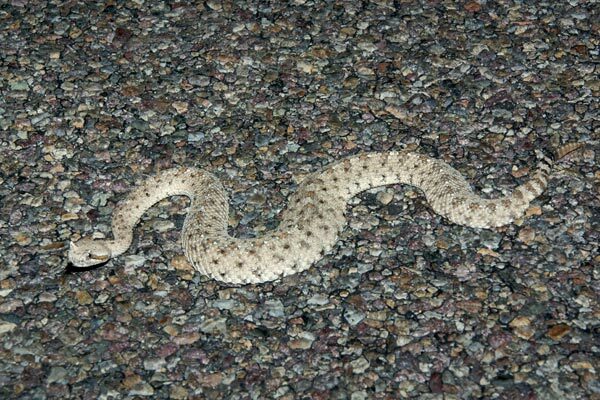 After the 2nd monster, we saw a couple of western diamond-backed rattlesnakes. One of them was stretched across the road until we passed it, then coiled up and postured for us as we went back for photos. 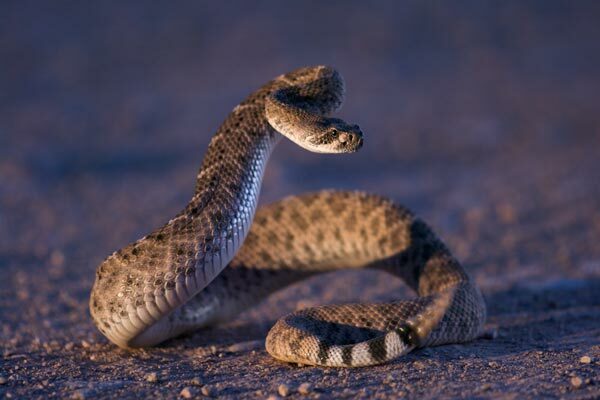 The sun was just setting and the snake was illuminated almost entirely by the headlights of Roger's truck. 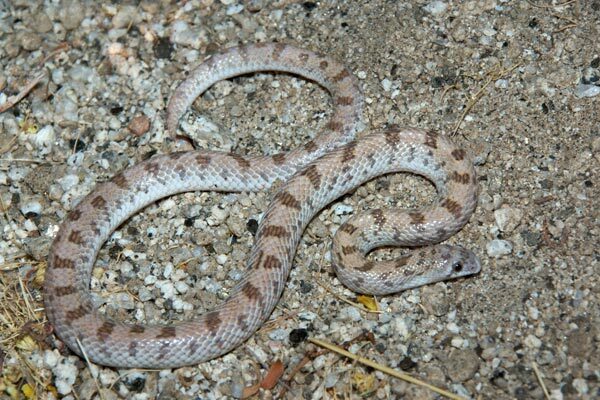 After the rattlesnakes we came across a young Arizona glossy snake, always a welcome sight. That was our final snake of the evening. We also tracked a few of the diamondbacks, including one large male that we tracked twice. We first found him facing out of a burrow under a bush. We then tracked a couple of others, as well as Pilgrim, before heading back to the car. Roger decided to check whether the large male had moved from where we had found it an hour or so earlier. 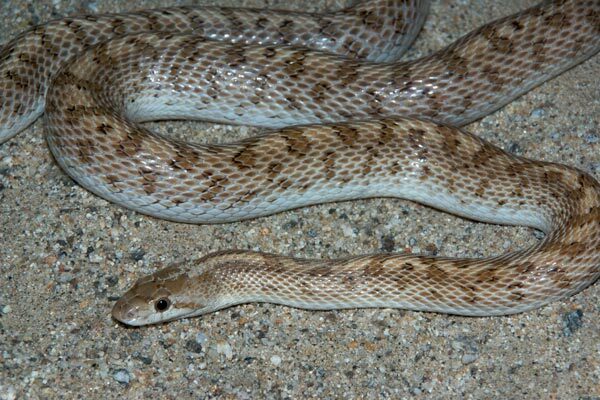 It turns out that it had left the burrow and coiled up in plain sight, nearly invisible in the desert sand. 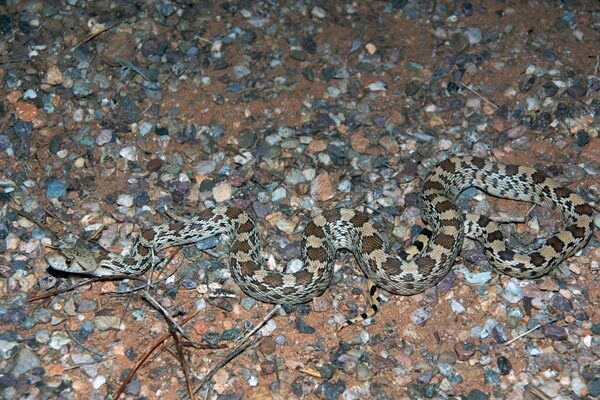 After dark we tracked two tiger rattlesnake study subjects, but each of them was still deep in a crevice. On the drive back home we passed through an area good for sidewinders, but we struck out on those. 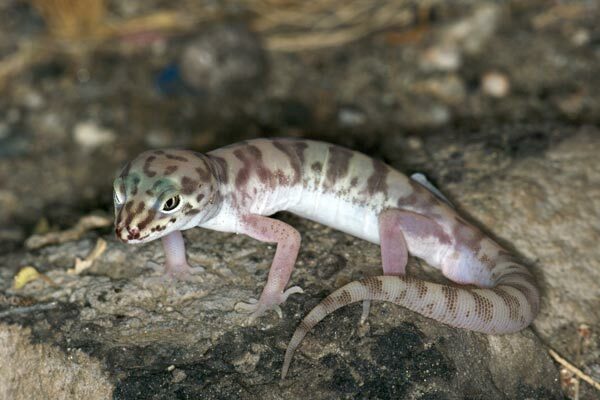 Our consolation prize was a couple of pretty little Tucson banded geckos (Coleonyx variegatus bogerti). After my weekend of oh-so-successful herping with Roger (for which I owe him everlasting gratitude), my wife and I and our dog entourage headed east and up to the cooler climes of Silver City, New Mexico, where we stayed for a few days, making occasional forays into other parts of New Mexico. The only snakes I saw while we were in the area were a series of DOR gophersnakes, but there were a few interesting lizards around. 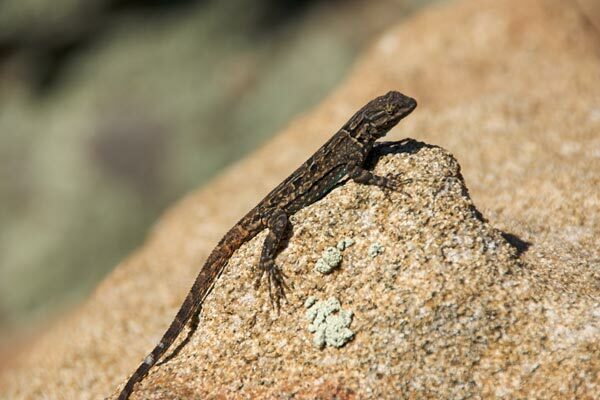 The most common lizards around were the tree lizards (Urosaurus ornatus schottii), which were mostly ignoring their common name and perching on rocks. Chihuahuan spotted whiptails (Aspidoscelis exsanguis) were also common, and were considerably less wary than most whiptails I've seen. It wouldn't have been too hard to catch a few by hand, had I been so inclined. This handsome specimen was from the remarkable Kasha-Katue Tent Rocks National Monument. 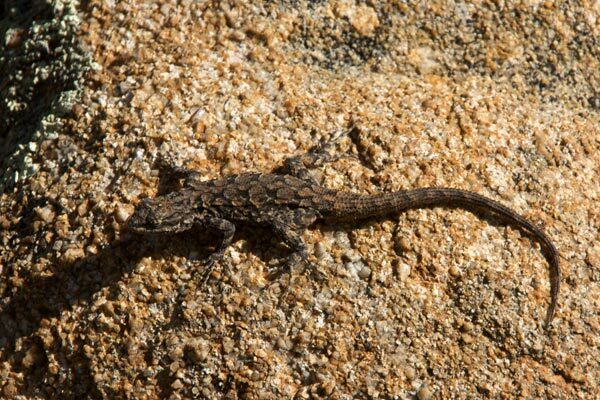 Your standard small nondescript Sceloporus were relatively common as well. 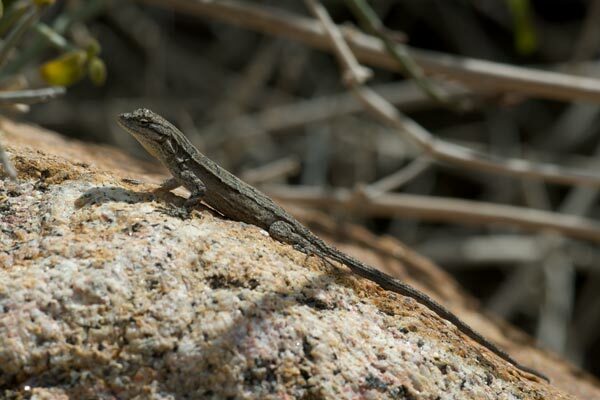 Here's a plateau lizard (Sceloporus tristichus) from the same Kasha-Katue Tent Rocks National Monument as the previous whiptail. I had never heard of this national monument before this trip, but it's well worth a visit, full of dramatic geology. 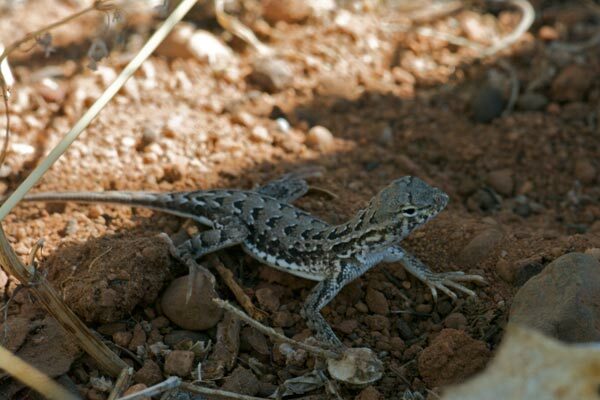 Finally, my one new lifer from New Mexico was Sceloporus poinsettii, an impressive beast that I had looked for in vain the last time I was in the area. This time I wasn't looking for anything in particular, but was just going out with my wife and the dogs for a morning hike somewhere different each day around Silver City. 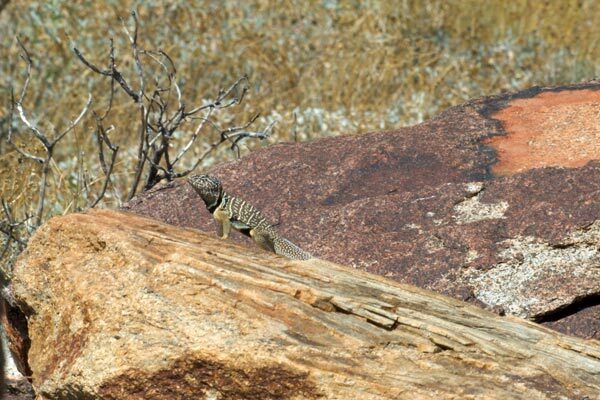 Near the end of a long hike, when the sun was just starting to warm things up, I spotted in the distance a large lizard perching on a rock, collared-lizard-style. It saw me and clambered under the rock; as it did so I saw that it had a banded tail and suspected it might be S. poinsettii. Fortunately the rock it had chosen was just small enough that I could turn it single-handedly. When I did so I discovered that the adult I had seen was sharing this hideout with a juvenile. 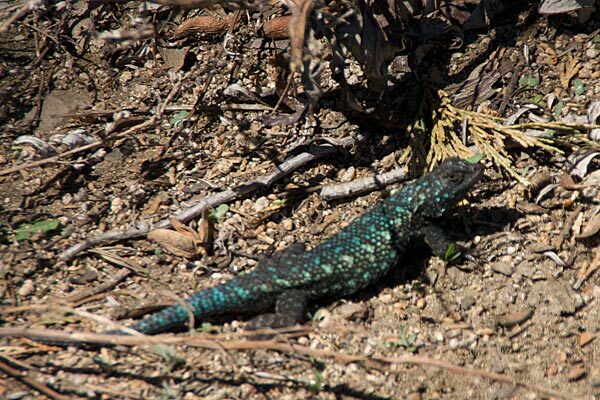 A couple of days later I saw a really brightly colored individual on a different hike. Unfortunately it was better at hiding than the previously-pictured lizards, and I only got a distant photo that hints at the bright colors. So those were the highlights of my spring trip. As usual with herping trips, it left me itching to get out in the wild again soon.